Not only do we play your song but we also play your movie! What could be a better occasion than Halloween to celebrate? 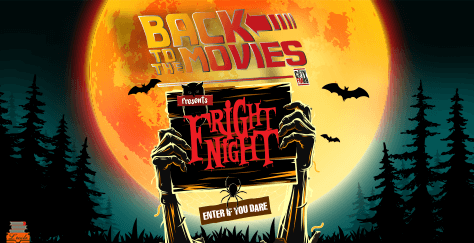 ‘Back to the Movies’ is a series of events CityFM89 will be hosting every few months where we fuse nostalgia & your favorite cult classics together! CityFM89 kick-started ‘Back to the Movies’ with its first ever outdoor cinema movie night, ‘Fright Night’, hosted by the amazing Ali Gul Pir! The night echoed with screams as our audience watched “The Conjuring” under the stars with their blankets on the 31st of October. It was a night of both trick and treat for not only did we have some very ghoulish activities planned along with the spookiest set up to make the experience better but we also had some great food that took care of our hunger pangs courtesy Lush Crush, The Waffle Cart, Wingitt, Desi Gali and Junaidi’s Pizzeria! The night echoed with screams as our audience watched "The Conjuring" under the stars on 31st October for CityFM89's #FrightNight presented by #BackToTheMovies. Back To The Movies is a series of events #CityFM89 will be hosting over the next few months where we fuse nostalgia & your favourite cult classics together.Thanks for great food that took care of our hunger pangs: Lush Crush, The Waffle Cart, Wingitt, Desi Gali, Junaidi's Pizzeria, the spookiest set up by @TheCircusEvents & special thanks to our amazing host Ali Gul Pir. Stay tuned to find out which movie we will be playing next!